FOOTMAD has been on the scene in Birmingham since 1980 and is still going strong. We have at least one dance a month with some additional dances and parties during the year. We also put on two highly acclaimed weekends of dancing — a contra weekend in Mentone, Alabama, and a southern square dance weekend at Cheaha State Park. Both are amazingly fun. Saturday night dances begin with a warm-up session at 7:00 and dancing begins at 7:30. 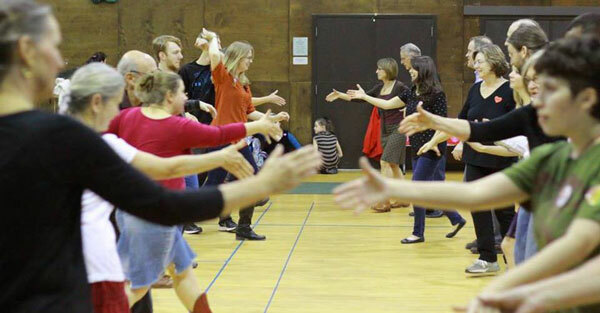 The warm-up sessions give new and experienced dancers a chance to meet and go over the basic dance moves and techniques before the dance begins. A caller teaches every dance. He or she walks the dancers through each sequence of moves before the music begins and continues to call the moves throughout the dance. Don’t worry about bringing a dance partner. You will find a lot of friendly dancers, but don’t wait for one to ask you to dance. Feel free to ask someone you haven’t met yet. At FOOTMAD men ask women to dance, women ask men to dance, women ask women to dance and men ask men to dance. The only rule is to have fun! Yes! Children are welcome at dances. They can join the dancing or just enjoy the music. There is a space at the end of the hall reserved for them to play in. No matter how cold it is outdoors or how well the gym is air-conditioned, you will get warm when you dance. Avoid sweaters and heavy clothes that can't be removed when the dancing gets hot. And you'll enjoy dancing more if the soles of your shoes don't grip the floor, so test them out before you come. Live music, good dancing and nice company are what you will find at Birmingham Friends of Old-Time Music and Dance. We hope you will dance with us often! $10 for adults, $8 for college students, $4 for those 13-18, and free for those 12 and under.